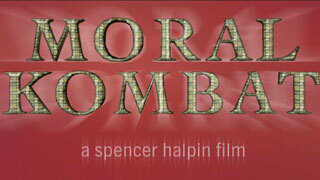 Moral Kombat, a documentary focusing on the effects (or non-effects) of violent video games has become available for free online, but only for 30 days. The documentary was finished in 2007, but the content remains relevant and timely regardless. Numerous industry figureheads are interviewed on both sides of the game violence debate, from David Walsh to Jack Thompson and Oddworld creator Lorne Lanning. While the information contained within is excellent regardless of where you fall in this debate, the style is definitely off-putting. Images of games constantly glide over the image, through people’s faces (really), or super-impose them onto a virtual character. Likewise, the music never stops either. It almost seems to be done to fit into the old gamer cliche that their attention spans are too short. Despite the general busyness of it all, Moral Kombat is effective and important, tracking the history and possible future of the debate on game violence. At a brisk 80-minutes, you can find the time.